An interview with Brewster Kahle, the founder of the Internet Archive, one of a handful of people who have received a National Security Letter and had the accompanying gag order lifted. Fantastic essay by Maciej Cegłowski looking at the technological and political effects of massive, secretive government surveillance. This is already old, but… There be a dragon in it. So there. We don’t have to choose between preserving privacy and preventing terrorism. We do have to decide how much oversight and accountability there should be when the government conducts surveillance of its citizens. Privacy is rarely lost in one fell swoop. It is usually eroded over time, little bits dissolving almost imperceptibly until we finally begin to notice how much is gone. When the government starts monitoring the phone numbers people call, many may shrug their shoulders and say, “Ah, it’s just numbers, that’s all.” Then the government might start monitoring some phone calls. “It’s just a few phone calls, nothing more.” The government might install more video cameras in public places. “So what? Some more cameras watching in a few more places. No big deal.” The increase in cameras might lead to a more elaborate network of video surveillance. Satellite surveillance might be added to help track people’s movements. The government might start analyzing people’s bank rec­ords. “It’s just my deposits and some of the bills I pay—no problem.” The government may then start combing through credit-card records, then expand to Internet-service providers’ records, health records, employment records, and more. Each step may seem incremental, but after a while, the government will be watching and knowing everything about us. 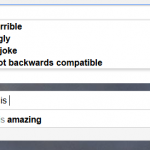 The difference between Google and Bing.